The last French Canadian folk music I posted was six months ago, so I thought I might feature another this week – especially since I found myself humming this song repeatedly. When that happens, I feel I have to go straight to the shelves, grab that piece of music, and remind myself of the innate qualities therein. This I did, and here it is for you, too. Joseph Ovila LaMadeleine (1880-1973) was a left-handed fiddler based in Montreal, where he owned a music shop. In the late 1920s, when he was already nearly 50, he began his recording career for Starr Records. 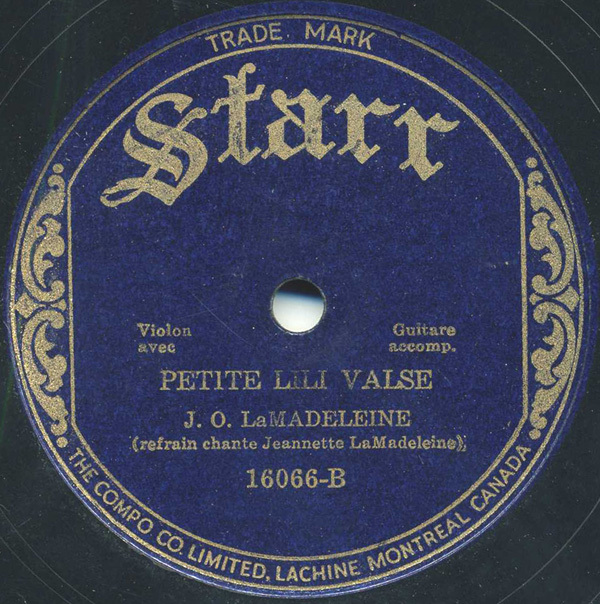 For the next 15 years on Starr, he recorded 54 records of wonderfully played reels, quadrilles, and waltzes like this track, which was recorded in the winter of 1937. While this tune is not a fiddle showdown like some of his others, I find it beautifully unpretentious, largely due to the vocal by his daughter Jeannette. Starr Records got its name from the Starr Piano Company of Richmond, Indiana. The Starr Piano Company also produced a little label called Gennett, only one of the greatest, most sought-after record labels in jazz, country, and blues history. The Compo Company (run by the son of Emile Berliner) began pressing the Starr and Gennett labels in Canada in 1919, and gradually began recording as well. The Starr label continued into the 40s, long after Starr Piano left the record business, with the Starr label reserved strictly for Canadian recordings. For more LaMadeleine, there is a track on the Rounder collection Raw Fiddle. You can also visit The Virtual Gramophone and hear quite a few LaMadeleine recordings, albeit at 64kbps. Better than nothing! Lastly, an announcement for 1960s African music fans: very soon I will be writing a guest post over at the fine Matsuli Music blog. There will be LOTS to download, and it will be very limited, so if you don’t want to miss that, keep checking Matsuli. Oh boy, I can’t wait for the African music, cool! Starr label, wow. I’ve never seen one of these before. Off to download right now, thanks for posting it! Listening to the Phata Phata right now…great stuff. You do the world a true service. phata phata is amazing, best compilation of songs i heard in a very long time! it must be amazing waking up next to the original records. Utterly charming piece of music. Simple yet stunning at the same time. Nice contrast to more frenetic French Canadian fare. Thank you.